Joey is a very engaging chocolate Labrador with boundless energy and full of curiosity. He is very sociable and welcomes a game, petting or a treat from anyone. His greatest joy is the long early morning runs with his dad. But it is not enough; Joey is always looking for more fun and excitement. 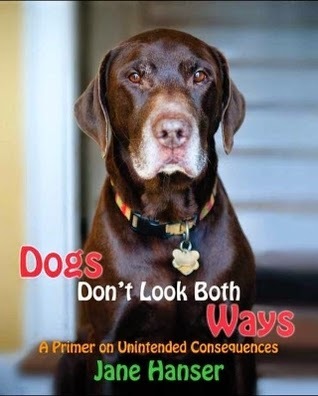 Dogs Don't Look Both Ways by Jane Hanser is an absolutely delightful story of her adventurous dog. The story is told by Joey himself. It does not just relate Joey’s escapades; it is a heart-warming tale of the love and dedication between a dog and his people (Mum and Dad) It is also very suitable for children. Jane’s writing is as enjoyable as Joey’s story. While I am certain Joey dictated the story to Jane it was Jane’s writing skills that polished the book. Beautiful and clear descriptions associated with scenery, change of seasons and all the sights, sounds and (because it is told by Joey) smells of Joey’s world have the reader right there in Boston with Joey and his Mum and Dad. In addition to being a good read, as a former Belgian Shepherd Breeder I believe this book should be essential reading for anyone who has or is planning to buy a working dog or high energy breed. It demonstrates the importance of understanding their personality, much of which is passed down through the breed lines. It was only through their understanding of the Labrador breed (evident when Joey talks about his ancestors) in addition to their boundless love for and dedication to their beautiful dog that Joey’s parents were able to get him through the trauma of his accident and resolve his seemingly limitless desire to seek out more fun, games and new friends. I was so taken by Joey that I checked out the website www.dogsdontlookbothways.com and picked up Joey’s blog. There is more good advice about understanding a dog’s body language among the posts. Thank you Jane Hanser for sharing your wonderful Joey with all your readers. This book is the sequel to The Sand Bluff Murders. Since resigning as Chief of Police in the quiet town of Sand Bluff, the main character, Jonas McCleary, is now a private investigator. I have not read the first in the series but that has not lessened my enjoyment of this book. His first case comes when an abortionist and his wife are murdered. The doctor’s clinics are the target of protestors. But are these protestors not as peaceful and caring of life as they claim or is the doctor’s daughter, Goldie, and her husband guilty because of the inheritance they gain? Goldie hires Jonas to prove her innocence. His investigation deepens when another body is found murdered. Jonas is not a gun toting, heavy handed PI driving fast cars. He is an ordinary and very likeable man who uses his skills questioning the interesting collection of characters and his contact with the local police to unravel the clues and get the result. He is also a family man but separated from his beloved family because of the need to earn a living. This warm story is cleverly intertwined with the mystery. The story is told in the first person by Jonas giving the author the opportunity to clearly express his character’s musings about the case. Albrecht’s detailed descriptions of mannerisms and thoughts give clear insight into the characters while his descriptions of scenes have the reader hearing and smelling the surrounds. This descriptive prose does not weigh the storyline down but provides the reader with clear images. A well written book with a result I certainly didn’t pick. Unfortunately too many people fall into network marketing traps before undertaking sensible business research. They end up losing a lot of money and spend wasted hours with no results for their efforts. 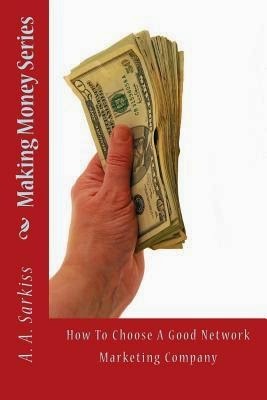 This brief but succinct book will tell you what to look for in a network marketing company that is safe and reliable. It is well laid out and written in easy to understand language. I have given this book 4* mainly because of its potentially limited interest. I am taking the liberty of posting reviews I have received for my own book, Angel with Drumsticks. I am honoured that all three reviews have rated the story 5 stars and they have been posted by authors whose work I have enjoyed. Here are their kind words about Angel with Drumsticks. 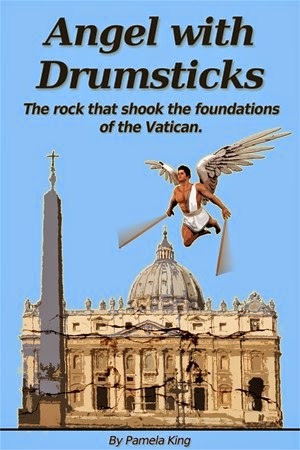 Angel With Drumsticks tells the absorbing story of a group of talented young musicians in the1960s who were squashed by the Vatican. I admit that, before reading Angel With Drumsticks I had never heard of the ‘Rock Mass’, ‘Beat Mass’, or ‘Mass for the Young’ as it was variously called. I had never thought of Italian bands experimenting and working hard to develop an ‘Italian beat’, influenced by the Beatles, but certainly no carbon copy of them. The Mass, performed in a church, and including two groups besides Angelo’s – the Bumpers and the Barrittas - was phenomenally successful in attracting a young audience; but the response of the Vatican hierarchy was as swift as it was unexpected. The band members were excommunicated (though the order was later rescinded). A proposed tour, including playing at the Albert Hall, was cancelled, all sponsors and venues pulling out simultaneously; the small company, Ariel, which had recorded the Mass went broke, and the three bands suddenly discovered that they could not even get gigs in small Italian towns. Those priests who had supported the Mass were moved to remote postings. ‘Angel and the Brains’ played in Tunisia for a while before breaking up, and Angelo’s promising musical career was finished. King has interviewed Angelo, who emigrated to Australia, and quotes his own thoughts and feelings, still vivid after nearly fifty years. King has interviewed Angelo, who emigrated to Australia, and quotes his own thoughts and feelings, still vivid after nearly fifty years. Angel With Drumsticks contains some fascinating photographs and newspaper articles, providing insights into the furore over the rock mass and the way the controversy has continued to re-surface over the years. It is a balanced account and at the same time a very personal one. The force and speed of the Vatican crackdown, when the bands believed the church had initiated the experiment in an endeavour to attract young people, remains a mystery. I highly recommend this book. Fascinating account of a band that became a phenomenon in Italy and were poised for worldwide tour and promotion when it appears the Vatican (who had asked the young men to perform music for a mass in the first instance ) suddenly caused every country to pull out of the tour due to internal debate and pressure around the use of "beat" music. In the meantime careers and young lives were destroyed with repercussions echoing 50 years later. Although the book is not written "against" the church the reader can clearly see the great injustice done to all these young men who had only ever followed what they had been asked to do. This book should be heavily promoted in Italy and for anyone who is interested in a memoir outlining a fascinating event and the devastating impact a church can have on individuals that the church has never apologised for or at the very least acknowledge the wrongfulness of their actions. An engaging read for music lovers also. A short interesting read that typifies the struggle of the 60s between youthful freedom and the establishment. In this case the mere mention of the parties involved, a pop (later rock) band and the Vatican, will arouse the reader’s curiosity. The many photographs interspersed within the text nicely depict the ambience of the ‘beat’ movement in Rome at that time and the main protagonist, the band Angel and the Brains. Those who remember this group should definitely read this chronicle of the injustices inflicted upon them by the Catholic Church.